Database management roles have long been a rich career seam for IT professionals. However, there has been, in recent years, a “Cambrian explosion” in the previously steady but sleepy world of databases. The relational database model, breaking the traditional dependency between data storage and applications, held sway in enterprise IT for decades, from the time of its serious commercialisation by Oracle in the mid-7os. Also hegemonic has been the language implementation of the relational model, SQL – Structured Query Language; which is of the same mid-70s vintage. But, in recent years, with the rise of the big data technologies of the Hadoop stack and the NoSQL databases, the data store and database scene has become more complex. And when it comes to the Oracle database, its creator announced it to be “autonomous” at Oracle Open World in San Francisco October 2017. What does this mean for database administrators (DBAs)? Does it mean the opening up of new roles of higher intellectual interest and value? Or does it mean redundancy and early retirement? As always with IT, the technology is only one-third of the story – the others being process and, crucially, people. What are the operational and organisational design problems to be solved in this more heterogenous database management landscape? 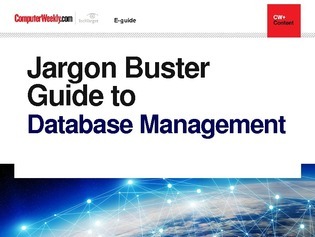 This Jargon Buster e-guide to contemporary database management is an aid to stepping back and thinking afresh about an area of enterprise IT that has many decades of heritage. Or, as many sometimes (arguably rudely) put it, legacy.